Background information Kristi Snyder-Colell, fourth generation Californian and life long resident of the Somis/Camarillo area has been an active member of the Visual and Performing arts community her entire life. She received her BA of Arts from Loyola Marymount University and her MFA through Pius XII, School of Arts Villa Schifanoia in Firenze Italia. She did post graduate work in Printmaking at Santa Reparata Institute of Art in Firenze Italia. 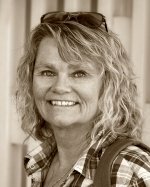 Kristi joined the California Lutheran Art Teaching Staff in 2006 following a successful forty year tenure as a Visual and Performing Arts Teacher and Department Chair at Newbury Park High School . While teaching for the Conejo Valley Unified School District she served on the first State Committee for writing the Visual and Performing Arts Framework and has received many Local and State teaching awards. While Visual and Performing Arts Department Chair at Newbury Park High School she was a major force in the construction of a theatre and establishing a successful Visual Arts program as well as the Visual and Performing Arts International Baccalaureate courses. Colell is currently employed by the Global International Baccalaureate Program as an examiner. She also serves as a judge for the Los Angeles Music Center’s Bravo Outstanding VAPA annual teacher/school award and chairs the ACCV Art Scholarship Youth program. Summer 2009 Kristi served as a member of Dan Welden’s International art teaching staff in Firenze Italy. Kristi has traveled throughout the US , China and Europe seeking new vistas and panoramas. (Over the years her art work has been shown in galleries in Florence Italy , Colorado , Washington, California and the Salmagundi Art Club in New York .) She has written libretto for two original musicals, met Pope Pius XII, met and sang for Pope John Paul, and Mozarts Requiem in Rome under Emeritus LA Master Choral director Paul Salamunovich. My philosophy Imagine, Create, Inspire. .